Pitt Cue Co was a tiny corner restaurant in Soho focusing primarily on ribs and other American bbq-style meat dishes. This location has now closed, but the company behind it has opened another, larger restaurant at 1 The Avenue, Devonshire Square, EC2M 4YP (near Liverpool Street Station). 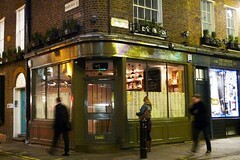 A tiny corner restaurant in Soho focusing primarily on ribs, as well as similar American bbq-style meat dishes. This is a permanent site for Pitt Cue Co., who previously had operated a food van on the South Bank. Note that like many recent openings, they do not take reservations, so you're advised to show up early. Inside, there's a zinc-topped bar at the ground level, with stool seating around the edge of the room for perhaps 6-8 people to eat. The main restaurant area is downstairs, with covers for around 20, very squashed in and dimly lit in the evenings. On Ewan's first visit shortly after they opened, a small queue had formed at 6pm, and it took about five minutes after opening for the first ten people to be seated. There wasn't even enough space to fit the 15-20 people outside into the upstairs bar while people were seated, so they were only letting in customers incrementally. The upstairs bar has one draught tap (entitled 'Whatever', featuring a rotating keg beer; you have to ask what this is), but specialises in a short range of cocktails. On Ewan's most recent visit in March 2012, the draught tap was dispensing Meantime Helles (£2/half). Downstairs the restaurant is very tightly packed together in a tiny square space. The menu sticks to a few basic dishes photo of the menu in Jan 2012, and specials are listed on a board as well as scrawled on the menu. Food is served on rectangular tin trays, going for a sort of prison-chic theme. Ewan tried the St Louis Ribs (£9) photo which were fantastic, sticky and slightly sweet but with plenty of tender meat falling off the bone. A side of burnt-end mash (£3) was also excellent, creamy mash topped with the burnt ends. On a return visit at the tail end of a Thursday lunchtime (around 2:15pm), there was no queue and only a few people upstairs. Ewan ordered the pulled pork bun (£6.50) photo, which was delivered quickly in a bag for takeaway. The soft bun was filled generously with tender pulled pork, as well as other pickled vegetables and a sweet sauce, eaten all too quickly and definitely worth a visit on its own. Last visited by bob, January 2015. Last edited 2017-12-17 15:26:10 (version 12; diff). List all versions. Page last edited 2017-12-17 15:26:10 (version 12).